car back in the Dublin area. You have the right to choose where your vehicle is repaired after an accident. Crashed car? Need to claim for repair? Our experienced customer-friendly staff can assist with the claims process to minimise any inconvenience. We invoice your insurance company directly so there is no cost to you, the customer. 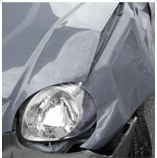 Gerry Maguire and sons is one of Irelands leading crash repair specialists located in south Dublin. Continuous investment in state-of–the art workshop equipment enables us to be at the forefront of vehicle technology and repair processes.